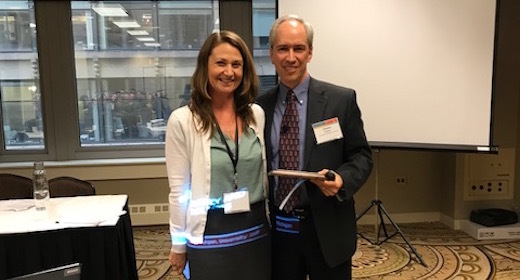 Charles Shipan was awarded the Herbert Simon Award by the Midwest Political Science Association (MPSA) at the MPSA’s 2018 conference in Chicago last weekend. According to the MPSA, the career achievement award recognizes a scholar who has made a significant contribution to the scientific study of public administration and bureaucracy. Shipan also delivered the Herbert A. Simon lecture at the conference. His talk, entitled “Bureaucracy and black boxes,” discussed the potential benefits and limitations of treating bureaucracies as black boxes, paying special attention to the relationship between agencies and other political institutions. Shipan has published numerous journal articles and book chapters over his career. His most recent book, Deliberate Discretion? The Institutional Foundations of Bureaucratic Autonomy, won several awards, including the Gregory Luebbert Prize for the best book in comparative politics and the Richard F. Fenno Prize for the best book in legislative studies.